Will catcher J.T. 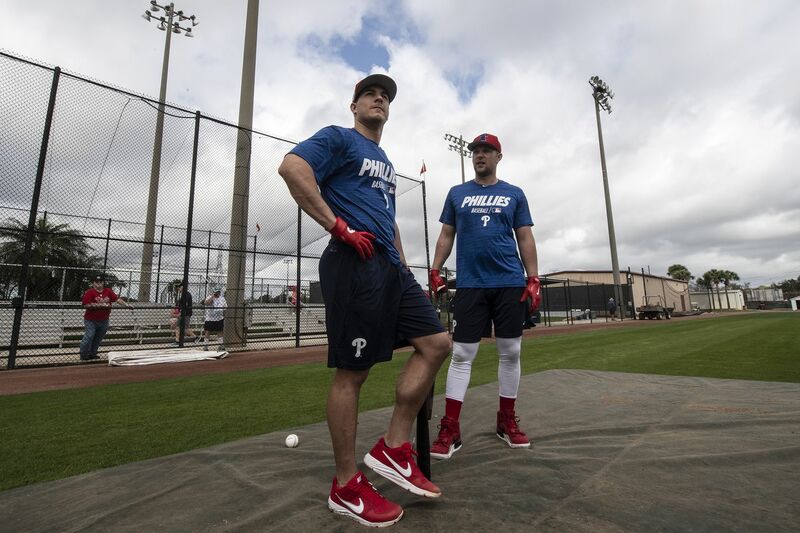 Realmuto, left, and first baseman Rhys Hoskins join the wave of young players to sign contract extensions? Both players said they would be open to talking about it. MIAMI -- It’s all the rage in baseball these days. Haven’t you heard? Contract extensions are more in than bubble gum and sunflower seeds. Over the past three months, nearly two dozen players have pushed free agency further into their future by signing long-term deals. Nolan Arenado, Chris Sale, Paul Goldschmidt, Justin Verlander, Xander Bogaerts and Matt Carpenter gave up a shot at the open market after this season. Mike Trout, Jacob deGrom, Alex Bregman, Luis Severino, Blake Snell, Ronald Acuna Jr., Ozzie Albies, Phillies ace Aaron Nola and several others chose to delay free agency, too. Everybody's doing it. So, how about Phillies stars J.T. Realmuto and Rhys Hoskins? Realmuto and Hoskins both said they haven’t been approached about extensions. Realmuto isn’t eligible for free agency until after the 2020 season; Hoskins is under the Phillies’ control through 2023. A source suggested that Realmuto and the Phillies share interest in a long-term deal. But considering it has been only two months since the team acquired the all-star catcher in a trade with the Marlins, neither side feels urgency to rush into anything. Hoskins is represented by super-agent Scott Boras, who has long pushed back against his reputation for steering his clients to free agency. The extension craze is a reaction to the slow-moving free-agent markets of the past two offseasons. Although Bryce Harper, Manny Machado and other marquee free agents wound up signing enormous contracts, the middle class, especially players in their 30s, had a difficult time. Dallas Keuchel and Craig Kimbrel -- a former Cy Young Award winner and an all-star closer, respectively -- still haven’t signed. That’s when the collective bargaining agreement expires. The next deal might be more player-friendly. Or maybe not. Maybe there will be a work stoppage. Either way, it could compel Realmuto and Hoskins to join the extension party. Victor Arano has been recalled in place of Edubray Ramos. If not for allowing 17 hits and four walks in four innings and posting a 45.00 ERA in spring training, reliever Victor Arano would’ve made the Phillies’ opening-day roster. Three weeks later, after three scoreless appearances in triple A, Arano was called up. Manager Gabe Kapler said he has received encouraging reports about Arano’s slider. Arano gives the Phillies more flexibility because he’s better suited to pitch multiple innings than fellow right-hander Edubray Ramos, who was optioned to triple A on Thursday. MLB commissioner Rob Manfred and Oscar- and Grammy-winner Jamie Foxx will participate in a pregame ceremony Monday at Citizens Bank Park to commemorate Jackie Robinson Day. ... Right-hander Zach Eflin will start Saturday night against Marlins lefty Caleb Smith.